Rickert is a mage-smith from the Vinheim Dragon School. 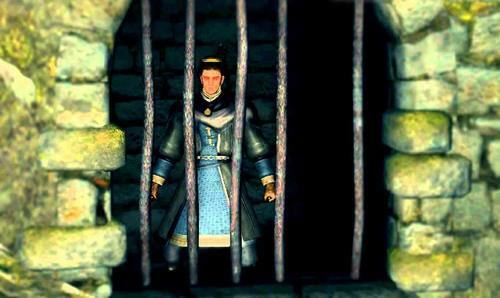 He was somehow trapped in a cell in New Londo Ruins and can't get out, but he doesn't seem to mind. He specializes in Magic weapon enchantments. Rickert was exiled from Vinheim, presumably because he became Undead. 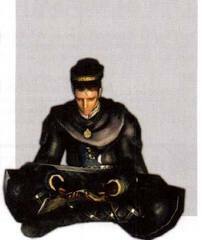 Not much is known about him except that he considers Big Hat Logan to be a legend dating back to "a hundred years ago", which could imply that Logan was kept from hollowing for so long by his ambition to get his hands on Seath's studies. Old Big Hat? Of course I've heard of him. Who hasn't in Vinheim? He was a royal member of Dragon School, until he turned Undead. I hear he was quite the character… Only, that was a hundred years ago. What interest have you in the old eccentric now? Sorcery? Don't ask me how it actually works. We only fiddle and forge, until it works itself in. That's how we do it in Vinheim, at least. We prefer to leave the theorizing to those uppity scholars. The first I've seen since my banishment from Vinheim. What do you say, friend? Mind giving that to me? This is no-man's land. I'm the only one who could handle it anyway. Hey, hang on… Is that… a sorcery ember? I've never seen one like that, not even back in Vinheim. What a brilliant flame! Please, friend, let me have that. I am begging you. I am a craftsman of Vinheim. I'd go Hollow before I pass up a flame like that! Hey, hang on… Is that an ember? Oh, no, I'm sorry. We of Vinheim don't deal in shoddy embers like that. Perhaps you should try an old smith out in the country. Mage Smith Set Worn by proper mage smiths who studied at Vinheim Dragon School.